This year I am trying to make a strong intake into lessening the UFOs around the sewing room. 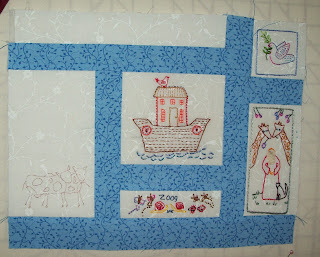 This is one I decided to tackle next...... Noah's Ark wall hanging. There is a link on the right hand side of my blog. This was kindly made available free by Lynette Anderson. I started it when The Scot was sick, and we had to attend chemo, Doctors appointments etc. 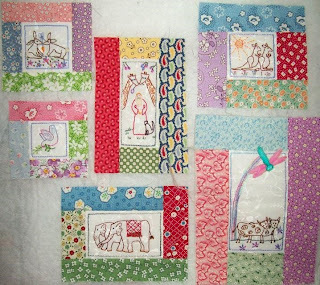 It was perfect I had the patterns saved each month, and then worked on them whenever we were waiting. The Scot didn't like talking, so I had to keep quiet, I tried reading, but I would get to the third page and wonder what the story was about and so have to start again. Embroidery proved perfect, I could sew and think at the same time whilst keeping quiet. When I set them out, it just didn't look good (to me anyway) so I decided to change my plan. So a lot of ribbiting and this is the new plan. Note to self.... never assume you are going to finish it.... 2009 will have to stay.. but I will correct it on the label on the back lol. all the applique is finished. I just have to decide on what to put around it, and what to do with it. This is really old, it must have been started around 1990. It is a Dianne Johnstone design. and these are the beans. He had to put up another height of mesh for them to climb. Please don't make any jokes about him being Jack. Well done you. This has to be the year of UFO for me too I think. Doll's houses! Dear hubby has done jolly well with his garden produce. The cage is coming into its own and looks like it has been there ages. Great piece of work. Sheila, the Scots garden is wonderful. 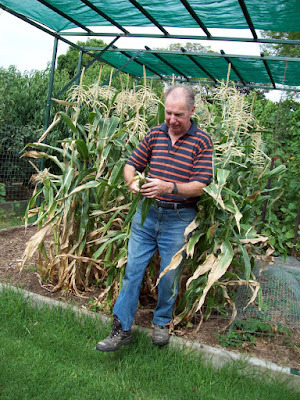 It is so nice to be able to grow your own vegees. 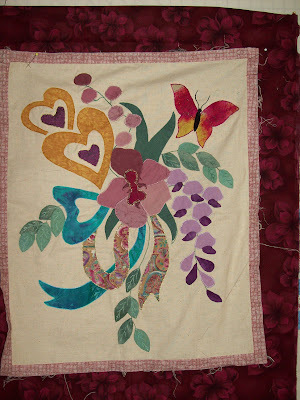 I love the applique quilt you are going to finish. The colors are perfect. I started a few Noahs arc stitcheries but just never got going with it. Yours looks great! Good for you, getting UFOs done! I love the new look of the Noah's Ark, Sheila. Very fresh. You are really plowing through it all. Pretty soon you'll be able to start lots of newt things! Your garden makes me sigh. 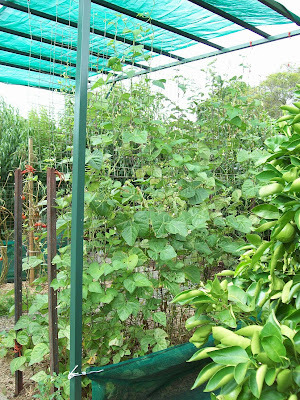 We are all poring over seed catalogs and dreaming of fresh veggies. Nice to see your finished Noah's Ark. I have downloaded the patterns and that is as far as I got! oooppsy yep the garden is looking tasty indeed.